In 1973, following many years of wild turkey (Meleagris gallopavo) restoration efforts, the Game and Fresh Water Fish Commission (predecessor to the Fish and Wildlife Conservation Commission) conducted the first statewide assessments of the distribution of wild turkeys. In 2001, the FWC Wild Turkey Management Program (WTMP) conducted a similar map-based survey by mail for comparison. After this survey the WTMP included 10-year assessments of the distribution and relative abundances of wild turkey to FWC’s “Strategic Plan for Wild Turkey Management” to further monitor population trends of wild turkeys. We conducted this second assessment in 2011 using a specialized online Geographic Information System (GIS) and created an online mapping application for viewing survey results. To begin the 2011 assessment, the WTMP and upland game bird staff at the Fish and Wildlife Research Institute (FWRI) worked with an outside vendor to develop an internet-based GIS mapping system. Resource specialists from FWC, other state and federal agencies, and industrial timber companies, as well as members of the Florida Chapter of the National Wild Turkey Federation, the Florida Chapter of The Wildlife Society and antlerless deer permit holders were asked to participate in the survey. Survey participants used personal computers and the online application to select specific cells of a 1 km x 1 km grid covering the state for which they were familiar and enter turkey abundance information. The system provided a hierarchy of underlying maps – statewide aerial photography; statewide rivers and major roads; and county, city and conservation area boundaries – to assist respondents in recording turkey abundance data geographically. In total, 310 people responded to the survey; unfortunately, survey responses accounted for only about 65 percent of the state, and other means were necessary to acquire information about areas lacking survey data. To this end, WTMP biologists turned to staff at FWRI for additional assistance. Research staff developed a Likelihood-based Moving Window Model that used extrinsic data (including habitat suitability models and movement distance data) and information from known areas to inform estimates for unknown areas. For every cell of the statewide grid, the model evaluated the distance from known locations and pathways through suitable habitat from known turkey locations to determine the possibility (or likelihood) of at least one turkey being able to reach and occupy the cell in question. Staff then conducted field surveys to validate these underlying models and databases to ensure they accurately reflected conditions on the ground. 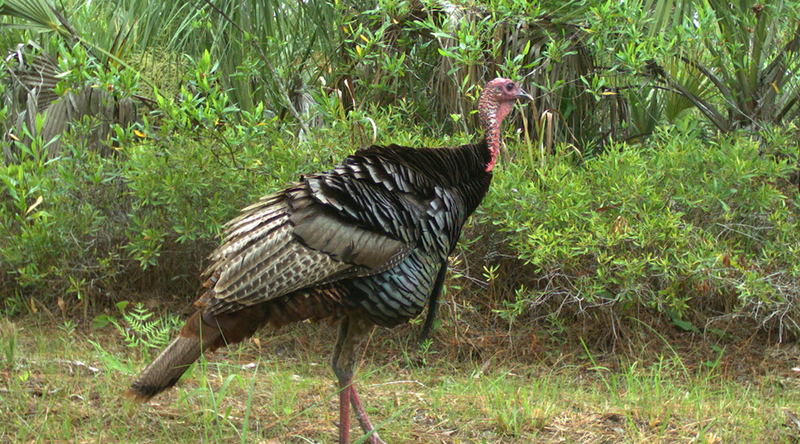 These efforts culminated in a spatial dataset that represents categories of predicted wild turkey presence throughout the state of Florida. The final step of the project was to build a web-based mapping application that allows for public viewing access to the assessment results. This online tool is available at: http://atoll.floridamarine.org/FLWildTurkeyModels. Figure 1. 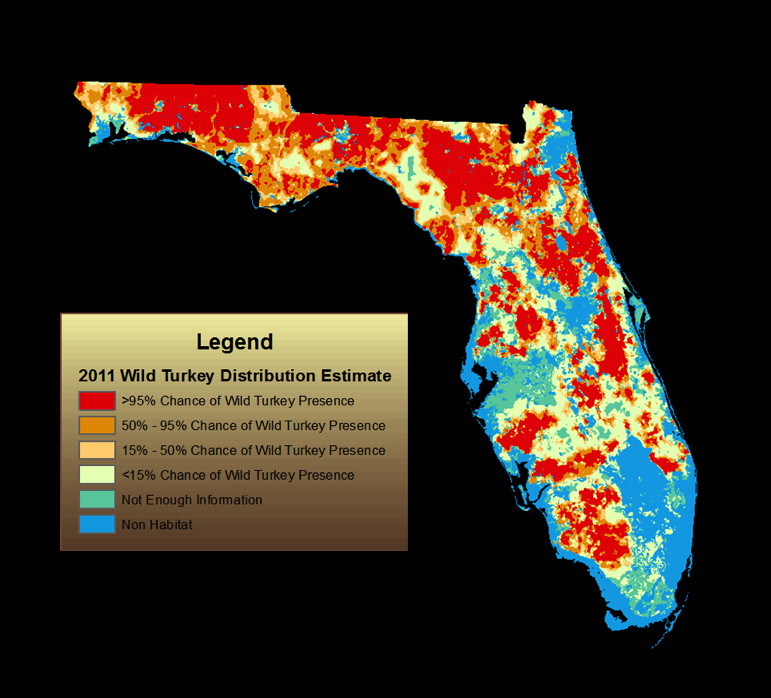 This map displays results of a 2011 statewide wild turkey distribution assessment. Note that this model provides estimates using best available information and these estimates do not replace ground surveys. However, given that wild turkey are a generalist species and widely distributed, the prediction accuracy may not be exact in all areas. Although this information is useful for depicting the general location of turkeys within Florida, caution should be taken when considering local areas, because the survey resolution (1 km x 1 km) and data are not well suited for small spatial scale application. Using the spatial data derived from this project, FWC staff will be able to relate current turkey population distributions (based on the 2011 data) to previous assessments, vegetative communities, land ownership, harvest records, and other pertinent information. 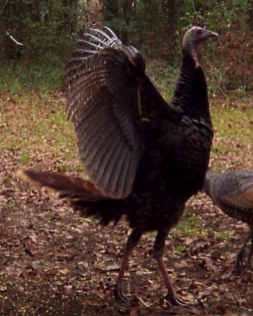 This will allow the FWC WTMP to focus management on particular areas of the State that have suitable turkey habitat but low turkey populations.